New Neighbors - For more than 20 years, Community Greetings has been helping people settle into change. RECENTLY MOVED TO A new home? Your first neighborly greeting might very well come from a representative of Community Greetings, a service started by former Welcome Wagon employees to help new residents get settled into their neighborhoods. 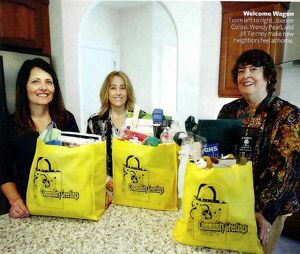 Community Greetings reaches out to people with new residences and/or new families, paying a visit to their homes armed with a goody bag of coupons, promotional items from area businesses, and all the information a new homeowner might need from the town everything from voter registration forms to trash pickup and recycling schedules. "Everything is so impersonal these days," says Wendy Pearl, who spans Danvers and Peabody as one of the three partners who own Community Greetings. "People really appreciate the personal touch." Pearl and her partners Joanne Colosi, who covers Boxford, Middleton, and Topsfield, and Jill Tierney, who covers Newbury, Newburyport, and Plum Island, all have deep roots in the areas they represent, as they are long-time residents and participants in the chamber of commerce and local government. We are a part of the community. Because we live here, people feel comfortable asking us questions," Pearl says. Sponsoring businesses pay per visit for the service, and the three women that they would never accept a sponsor they would not personally frequent In fact, Tierney's welcome package includes her own physician, among many favorite businesses. "I won't advertise for a business if I wouldn't use the business," Tierney says: noting that people are very grateful for their personal endorsements. Colosi agrees. "People are beyond appreciative," she says, adding that it would take someone hours to track down information conveyed in one 30 to 60 minute visit. While the three agree that welcoming people in their new homes is a lot of fun, it's not without its hazards. The partners are quick to point out that bad experiences are rare, but they have endured their share of unusual and inquisitive pets. Tierney recalls a homeowner with loose ferrets, one of which sqeezed behind her back. Another homeowner conducted the visit while her pet birds flew overhead. Not a huge animal lover herself, Tierney gamely continued her presentation, making sure to include information about a local veterinarian. Surprisingly, in this age of complete connection via technology and internet, tracking people down to welcome them has become the hardest part of the job. "Our biggest challenge is connecting with people," says Colosi, who notes that these days many people don’t have a landline. To solve this dilemma, they have turned to an incredibly old-fashioned method for introducing themselves - knocking on doors. When a smiling stranger bearing a tote bag arrives on their doorstep, Pearl says most people especially the younger generation - are skeptical at first. "But then are floored."